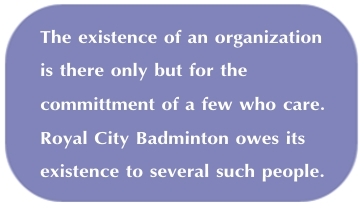 The Royal City Badminton Club has been in existence for over 40 years. It originated as a small group of tournament players looking to play more through the week. In the mid 1970s, games were held at the Armories and at several high schools in Guelph (Westwood, Centennial CVI and College Heights) and membership consisted of 10-15 adults. Over time, the club became more organized and expanded its membership to include youths. In 1984, when the first club newsletter was distributed, the club consisted of 40 adult members (membership fee: $30). The following year, Junior players (age 15-18) were invited to join for $20. At this time, the first coaching clinic was held by Norm Buck. In 1986, children as young as ten were invited to play on selected evenings. With a growing number of volunteers in the late 80s and early 90s to assist with various club functions, the club rapidly evolved. The very first club championship was held at the end of the 1989-90 season. By 1994, membership had risen to 73 members (adult fee $35) and 3 members received their Level 1 NCCP coaching certification. From 1989-1996, inter-league play was run with Cambridge, Kitchener, Erin, Elora and Guelph. Badminton skills continued to improve, particularly among the club's youth. In 1996, 10 club juniors qualified for District 10, with 5 of these players moving on to CWOSSA. Ladies junior doubles placed 1st and 4th at CWOSSA. The addition of designated court supervisors in the late 90s was a pivotal change to facilitate more organized play. Around this time, another marked event was the merging of Centennial Community Badminton Club and Guelph Badminton Club with Royal City Badminton with club play taking place at Centennial High School. By 2001, membership had soared to 109 players. Royal City Badminton seemed to be gaining more and more momentum. However, in 2002 the School Board imposed a 741% increase in court rental fees. Membership fees were forced to increase to $110/adult. As a result, membership numbers dropped to 94 and continued to plummet to only 74 members the following season. In 2004, fees increased again to $125 and club membership dropped to 62. Despite this setback, the club managed to stay afloat with its dedicated team of volunteers and several key milestones took place. RCB's web site went live for the first time on August 10, 2004. Club tournaments increased to 3 per season and the club championship was re-introduced after a ten year hiatus. Finally, after several years of protest, some reprieve in gym usage was achieved in 2005. Membership fees were lowered by 28% resulting in a noted increase to 94 members. This same season, the first summer adult badminton play was organized by George Spence and held at the Evergreen Centre. In addition, the first student badminton summer skills camp "Smash Camp" was organized by Jeff Millard. The club is now operating at maximum capacity (120 members) with a 9-member volunteer executive team. A Ladder Board was introduced in 2011 to create a more organized system of play. Looking to the future, the club hopes to provide more and more coaching for beginner players, especially for young members. To work towards this goal, the club provided financial support between 2009 and 2012 for six members to complete their Level 1 NCCP coaching certification (technical component). Starting in the fall of 2012, Jeff Millard organized designated nights for coaching for any interested players.